The Philips BV Libra holds wide appeal for its optimal price/performance value as well as its speed and ease-of-use for surgery procedures. Operators will be able to steer this system into the tightest spots and then, with hardly any effort, position the c-arm right where it is needed. In fact, the BV Libra c-arm features what is called “humanware” design, which refers to the system’s handles and contours that are shaped to be used by people.After moving the c-arm into place, operators will notice that the machine has single button control and an interface with a minimum amount of menus and other functions, making the system easy to use for beginner operators. 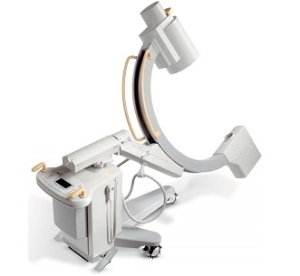 In terms of actual imaging, the BV Libra c-arm advanced image processing capable of vascular subtraction and remasking; real-time contrast, brightness, and edge enhancement; automatic movement detection; and BodySmart software which recognizes anatomy. Parallel movement capabilities also extend the c-arm’s field-of-view for spinal procedures. The BV Libra c-arm also seeks to protect your patients with its real pulsed fluoro mode that cuts dose in half. The system also has unique beam filters that reduce skin radiation exposure by half.